We are three months away from having the old pattern of Standard be gone completely. It’s a new and exciting time, as we try to figure out what effect there will be on our favorite cards. Do you remember her? Tokens all over, fetches finding battle lands, her sick combo with Wingmate Roc, where you could minus her to kill their Rhinos and keep your birds? How about with Devotion strategies? Remember when you had to have a plan for her? 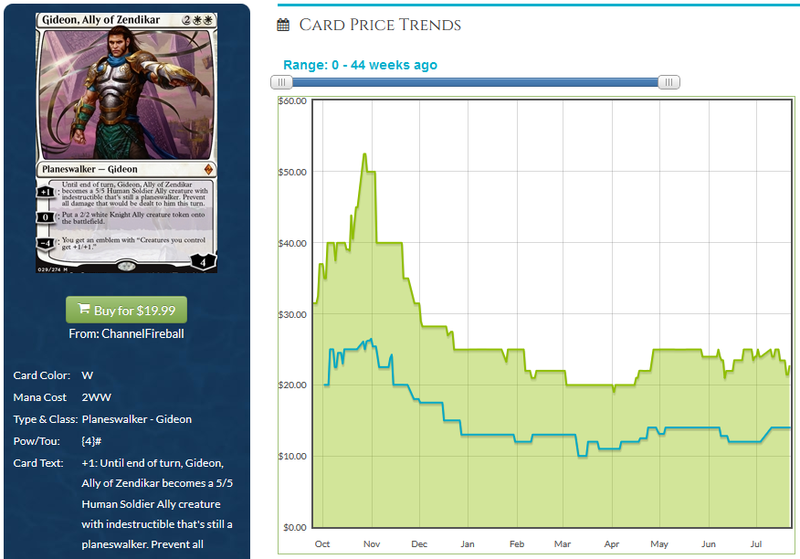 Elspeth was a staple at first, her price dropping down slowly, but spiking when the new block was released. This is a trend that had been well-established, going back more than a few sets, where the next big set would introduce mechanics or decks that played very well with the cards from the previous sets. Then, when the rotation was about six months away, the card would begin to lose value, as people got rid of extras and tried to keep no more than a playset. Elspeth was hit extra hard, as her Duel Deck vs. Kiora came out about the time of Fate Reforged. That’s the old way. What harbingers do we have of the new way? Go ahead and look up how many GW Tokens builds are playing Hangarback. I’ll wait. It’s a long list. This card is a four-of all over the place, it’s seeing some Modern and even Vintage play, and yet here it is, south of $5 for a card that reeks of value! It’s gone down ever since its release! Maybe it’s because of Magic Origins, maybe because it’s a rare. There are a lot of factors at play and I am not pretending to have all the answers. One card does not define a trend, but good grief, this is a powerful and commonly-played card to be so cheap and to have consistently fallen in value. Gideon is the first planeswalker in some time to be an automatic four-of, because his emblem is an easy out for extra copies. He is just as ubiquitous as Hangarback, and is a mythic! Despite all that, he is staying stable. The rotation for him is in 2017, so he’s got three sets to create a new pattern. But will he? I like stability, but what I really like is the chance to go up. Unfortunately, that’s all it is right now: a chance. If there were more time to go, I’d like his chances more, especially as he’s BFFs with Nissa, Voice of Zendikar. That’s a combination I would like to put serious money on, except that the window for profit is a lot smaller. Avacyn is still being opened. She’s in one pack of Battle for Zendikar and we’ve got three months of EMN-EMN-SOI in front of us. She hasn’t hit maximum supply yet, but she’s so good and played so frequently that you might expect her value to be trending upward. Not at all, though, not at all. I’m looking around, and I’m seeing a pattern of cards that are fantastic in Standard not growing in price as they used to. I’m not sure if it’s the timing, or increased awareness, or greater supply, but Standard doesn’t seem to have the big gains it used to. Sure, we get spikes on Demonic Pact when Harmless Offering is spoiled, or Day’s Undoing gets a couple bucks thanks to a new prison-style deck, but those are small and don’t appear to be sticking around. Plus, those are rotating when Kaladesh arrives, and no one is going to buy more than the fewest possible. So if Standard isn’t where we find the chance of increasing value, where do we look? Kalitas is not nearly as commonly played as Gideon or Avacyn, yet he’s worth more. He’s a small-set mythic, true, but look at where he’s seeing consistent play that the other two aren’t: Modern. I’m also paying attention to Ulamog, the Ceaseless Hunger. He’s golden in Tron, a turn-four play if you get the set plus an extra Tower. Oof. Want another example? Look at Nahiri, the Harbinger. Same set as Avacyn, played in a lot less decks, worth about $5 more. She’s a two-card combo that takes a little time and has some potential for disruption, but the power, and the price, is worth the attention. I’m not saying this is the pattern for all time in the future. I don’t have enough data to make that prediction. What I am doing is keeping an eye on these cards, and others, in order to make sense of things. Maybe Gideon will spike in Kaladesh. Maybe Kalitas falls off the map. We will have to see, but these slow decreases for very good Standard cards may be the new normal. I think Gideon and Nissa are going to tell me the pattern for the new Standard. If they go up during Eldritch Moon or Kaladesh, and then drop like rocks during Aether Revolt, that would mean the old pattern is still in play, just on a condensed timeline. 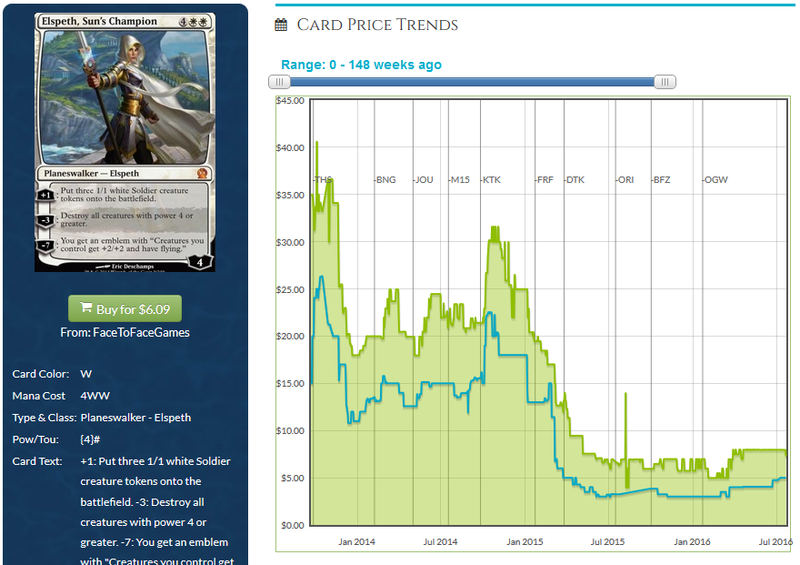 What I suspect, though, is that people have learned their lesson about the value of cards as they approach rotation. No one waits to out their extras anymore, and that could mean a whole new pattern to learn. Cliff, I’m sorry but you have to do more research or write your articles better about Standard cards. Hangarback was near unplayable as decks started jamming Anafenza and Silkwraps and then Kalitas and Reflector Mage from Oath were printed, then Dec in Stone in SOI and even Anguished Unmaking. Hangarback also isn’t a Human and isn’t a CoCo target, it is NOT a popular Standard card and hasn’t been for months. It also doesn’t fit into Affinity in Modern as people hoped so combine all that and it isn’t and hasn’t been a popular card. Oh, one more thing, he was reprinted in an Event Deck!! Next, Nissa Voice of Zedikar exists in ONE deck, Gideon is in several. Nissa is also going to be in a dual deck…as you mentioned this crushed Elspeth’s price. If you want to buy Nissa VoZ go ahead but please pay attention to Standard deck results and future reprints before giving advice. The second half of your article is actually fine. I’m just super annoyed with the sloppiness and lack of effort put in to the first part of your article. 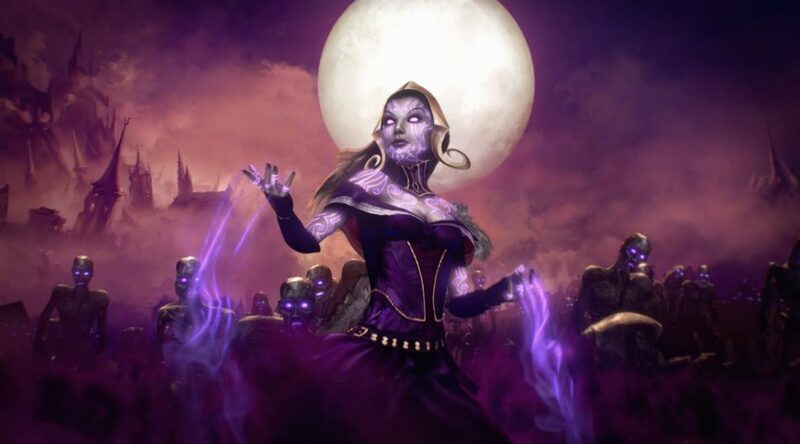 How have Origins cards like Nissa and Liliana performed in value? How about the Dragonlords, Dromoka’s Command, Den Protector etc? I totally agree that Modern Playables that are Standard legal have much better profit potential. I love Newlamog as a spec right now. 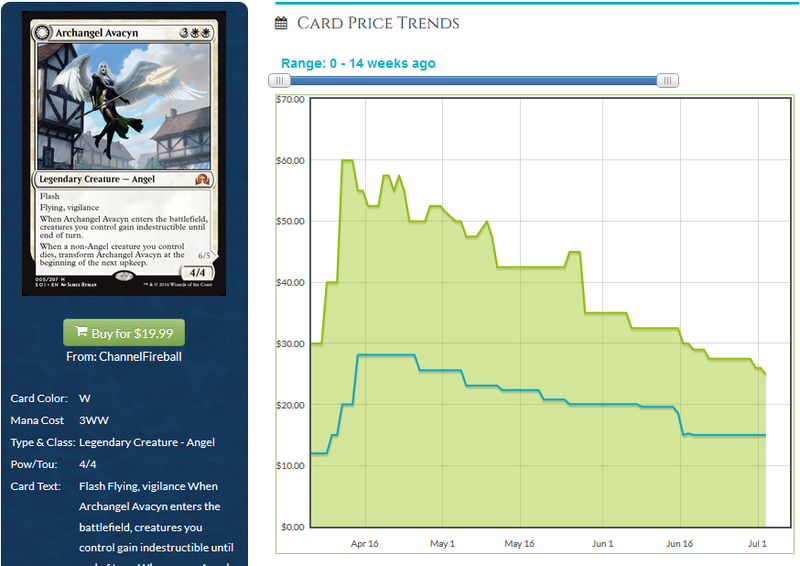 And I do think it’s a joke that Nahiri is more expensive than Avacyn but time will figure that out. Please put more research and effort into your card analysis, this could have been a great and in depth article. Thanks for taking the time to comment. It’s great to have feedback of all kinds. There are still a lot of decks playing Hangarback, and you’re right that tools have been made to deal with the threat, because the card is just that good. I’m not trying to tell people to spec on Nissa or anything else this week. I’m pointing out a trend that I’ve noticed and I think others should pay attention to as well. Hangarback Walker is being played in Vintage so it’s strong enough. It’s not too strong so it won’t get banned. It’s colorless so it can go in any deck. It’s not expensive so even if it did go down you wouldn’t lose much. It has a fairly unique ability. It’s a 2 drop. The worst thing that could happen to this card (besides a reprint) would be if it got replaced by a better card. I don’t have any copies of this card, but I’m going to buy in when it bottoms out. I bought 16 Elspeth at $4-5 a few months ago on Rogue Deck Builder’s advice. We already know it’s good. Usually when you cast it you win the game. New cards in the future will make it better or at least easier to cast. They printed a lot of copies of it, therefore it’s going to take longer for the market to dry up. I’m not interested in any of the last 3 mythics. It’s not good to invest in expensive newer cards. You have to wait much longer to sell. You don’t double up until these cards are like $40-50. It’s a lot easier to double up on a $3 card. Gideon isn’t even very unique and it can be easily replaced. Archangel Avacyn looks perfect for a From the Vault set or another reprint. AshyLarry, Hangarback got a huge jump in value when he was in a shops deck that I believe won a Vintage Masters event (the largest yearly Vintage event). My facts may be be slightly off but u r right his spike and appeal is due to Vintage…that does NOT mean his non-foil value will ever go up. Monastery Mentor, a small set mythic, which is in Legacy and Vintage and in top decks, is only about $10 right now. If Hangarback drops to $2 I will likely buy some playsets as well, but if foils drop super low that’s where I’d park my money vs. Non-Foil but that’s a personal preference. The one part of Cliff’s article that I very strongly agree with is “is Standard Legal card XYZ played in Modern”? If so it tends to be a very strong spec target. Gideon had seen play in some Abzan token builds a few months ago, i’m not sure what happened to those decks but they seem to have fallen off. I think I will be actively trading away Gideon at this point except the 4 I need. Newlamog is played in Tron, a top tier deck, and that is why he’s an appealing spec right now. Elspeth will eventually go up, but I think it is rather weak and lame for finance writers to call Elspeth a good spec. We know Theros Elspeth was Amazing, we also know she had a dual deck printing, we know the historical pricing of planeswalkers…eventually she’ll go up. Jusy how incredibly long do u want to wait?? For 3 regular Elspeth’s I’d rather buy 1 Newlamog. 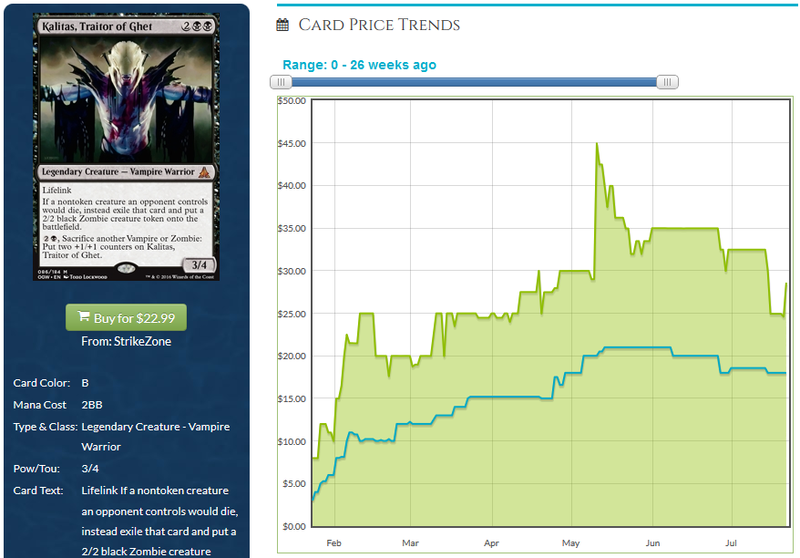 He’s more likely to spike to $20 in 1 yr, Elspeth would have to go up to $7 for the same profit margin. 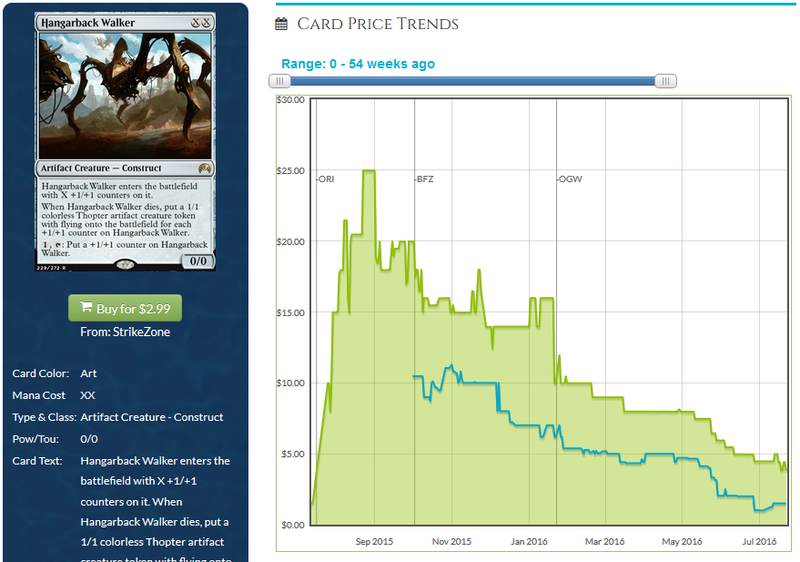 Also, Jace Architect had a dual deck printing and that crushed his price. He’s actually played in Modern (sometimes alongside Elspeth) and his regular set non-foil price has never recovered. Dont forget Gideon comes from a set where the value of cards are oppressed by expeditions. And Nissa will be reprinted in a dueldeck.